Even computers with the powerful third and fourth generation i7 Gigahertz processing power and Gigabytes of RAM need to be optimized. If you use your computer on a daily basis, you may not realize that it is getting slower by the day. The computer registry gets cluttered with useless registry keys and it just is not smart enough to get rid of the clutter on its own. The computer hard drive also gets cluttered with useless files that can and will slow your PC to a crawl if not properly optimized on a daily basis. You can think of a computer as the human body with the computer registry being the brain and the hard drive running the rest of the body. You know what it is like to have a lot on your mind, to many things to do and not enough time in a day. A brain is a terrible thing to clutter because it can easily slow your daily functions to a crawl while trying to access information that should be readily available. This happens to the registry too. The registry has its own memory that remembers everything that is done on the computer, which in time will bog it down making it slower to access vital information. Everything done on a computer whether programs are installed and uninstalled or simple tasks like web browsing are kept in the registry until it is cleaned out or optimized. A knowledgeable computer person can optimize the registry manually if he has way too much time on his hands but that is not recommended. If the wrong registry keys are deleted, the computer will become very unstable often unbootable. This is where a registry optimization program comes in handy. Back to the human body reference, when you eat too much your body slows down to a crawl until some of the food is digested or removed in another way. The same thing happens to the computer hard drive. Over time, it stores files that are not needed and slows down the computer until these junk files are removed. Again, this can be done manually but who has the time to dig around the Windows file system. If you uninstall a program, more than likely the folder for that program is still on the hard drive and referenced in the registry. If you browse the Internet, temporary Internet files are cached on the system. Some of the cached files are okay because they are intended to make web browsing faster by not having to download an entire web page every time it is viewed. The problem is that it also stores files if you only go to a web site once and those files are unnecessary and will slow the computer down. A good computer optimization program will remove the unnecessary clutter on the hard drive thus optimizing the computer. A good computer optimization utility will have all of the necessary tools available to maximize computer performance in one neat little package with very little effort on your part. The computer optimization programs below have been tested, reviewed and proven to do the job that they claim to be able to do. Most of them allow you to do a free scan to see how many problems you can have fixed. To fix the problems, you will need to purchase the program but if the utility doesn’t find any problems, simply uninstall the program with no harm done to your computer. A computer needs to be cleaned up in more ways than the average person has time for. The file system needs to optimized at regular intervals. The hard drive needs defragmenting. The registry needs to be defragged and optimized. 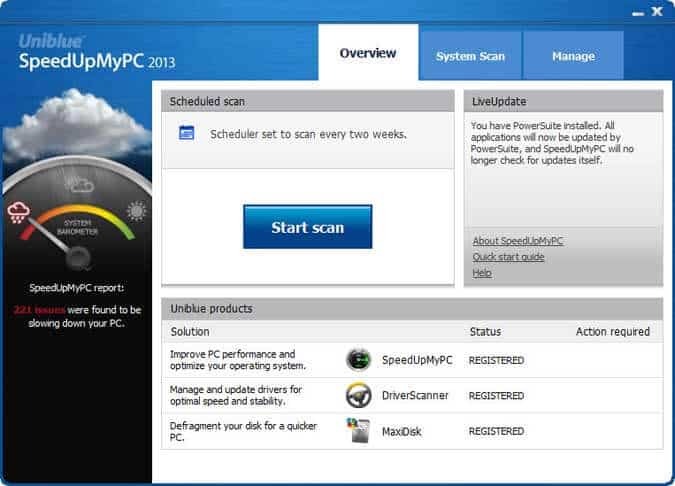 Outdated system device drivers can slow your PC to a crawl. The UniBlue PowerSuite combines MaxiDisk SpeedUpMyPC, and DriverScanner all for one low price in one easy to use package to keep your computer running at its peak performance. If your computer does not seem to be running at its peak performance, check out the UniBlue Powersuite Review. 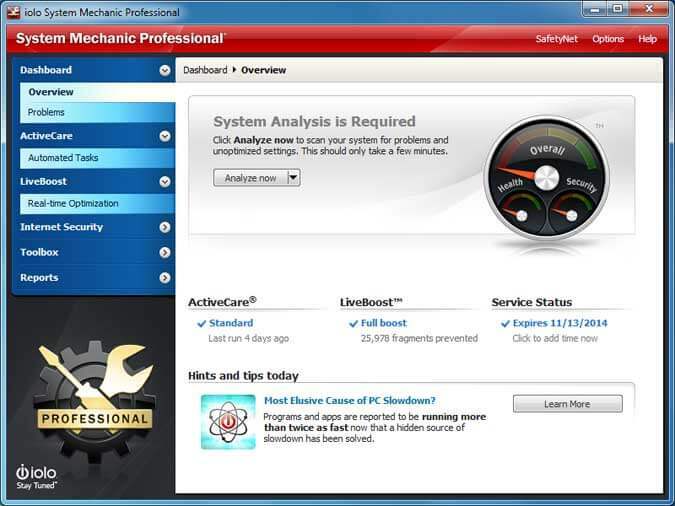 PC Mechanic is the newest Uniblue tool to optimize your PC to bring that new PC feeling back and keep it there. Fix. Clean. Boost. That is its claim. PC Mechanic scans the computer settings, files and processes to identify problems that may be slowing it down. It then uses its powerful range of tools to fix a wide range of problems. It finds and fixes Registry errors that cause slowdowns and crashes, frees up system resources to increase speed and reliability and removes the cluttered junk files that build up on a computer. Fix. Clean. Boost. Try a Free Scan!